Education. The educational portion of HEPS provides recipients with an understanding of the current threat environment. As our team maintains active situational awareness and reporting on the global, all-hazards threat environment, we update our threat presentation to help put context on what hostile events are and how they have been recently observed. Education also includes best practices for responding to hostile events and additional context and information. Individual Training. Individual training is conducted via our partnership with CPPS and their media based learning programs (see those resources here). This is training-on-demand which organizations can license and provide for their personnel to ensure a fully-trained workforce. Training can also be conducted in-person for desiring organizations. Planning Workshop(s). This workshop builds from the educational presentation and provides preparedness considerations for hostile events. This can be conducted in a “train-the-trainer” approach, giving leaders the information they need to go back to their organizations and prepare them for hostile events, or, our team can guide an organization through preparedness and key-decision planning to prepare for and respond to hostile events. Plans Development. Depending on the needs of the organization, this may include a site visit, assessment with respect to standards, reviewing existing plans and procedures and / or the drafting of plans and procedures for responding to hostile events. Tabletop Exercises (TTX). HEPS TTX events are intended to validate organizational plans and procedures for responding to hostile events. TTXs can be conducted for any level of the organization and may include external parties if desired. Training. This is not individual preparedness training but rather consists of developing training materials and training personnel to understand organizational plans and procedures for responding to hostile events. Drill(s). To reinforce training, validate procedures, and build staff confidence, we encourage the conduct of simple drills. Our team will work with you to design, develop, conduct and evaluate these activities to ensure they are safe and effective. Functional and Full-Scale Exercises. Adding complexity and realism to drills, Gate 15 and Ascenttra can design, develop, execute and evaluate the full-range of functional and full-scale exercises to include any number of partner organizations. These exercises can be small-scale and simple, or robust and complex with social media, actors, realistic attackers and any other necessary features to provide as real an experience as desired. We use the term "Hostile Event" to encompass a variety of events involving the killing or attempt to kill in public while having access to additional victims. This includes active shooter incidents, workplace violence and workplace attacks, lone actor and low-tech terrorism, complex coordinated terrorist attacks, and other related activities. In developing HEPS, we have leveraged best approaches, including the FEMA Preparedness Cycle and the Homeland Security Exercise and Evaluation Program. 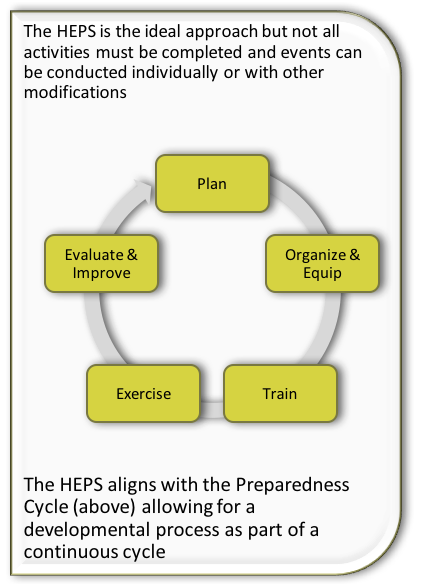 With those, and our experience and threat-informed, risk-based approach to preparedness and operations, we have developed HEPS with eight components (illustrated above) which, ideally, would be conducted sequentially and completely, but, under limited time and resource constraints, can be executed in parts as may be most useful for a given organization’s needs.